Georgian Teleradiocenter Ltd. was founded in 2000 after merging Georgian Television Center with Radio Center. The company's founder and 100% shareholder is the state. The company owns more than 150 towers, buildings and other infrastructure components on the country's entire territory. Some towers among them have a more than 100 meters height. The company owns and operates the DVB-T2 standard multiplex platform with covering about 99% of the country's population. The multiplex platform consist by headend, distribution and transmission network. The distribution network is realized on the Alcatel Lucent's microwave link system. Broadcasting is carried out on the frequencies given by the Georgian National Communications Commission. Total length of the links is more than 2000 km. Distribution network is built on a ring / star topology, which increase reliability. Basic transmission network is realized on Rohde & Schwarz TV transmitters. The secondary network (retransmission by air) is based on ELTI and Vigintos Elektronika TV transmitters. Currently, this multiplex platform is used for transmitting Georgian Public Broadcaster and Adjara TV content. The company also owns FM radio network by almost 99% coveraging for transmitting radio 1 ARKHI content. Tbilisi TV Tower – A separate structure for communication, constructed in 1955; located at Mtatsminda, Tbilisi. The first tower was disassembled in 1972. It was transferred to the town of Gori and the modern one was constructed at the spot instead. Georgian Teleradiocenter Ltd. administers the Tbilisi TV Tower. The tower communication systems provide DVB-T2, FM transmission, MMDS, cellular, trunking and other RF communication systems. The 274.5-meter TV tower is located at the mountain of 719,2 m above the sea level. The first TV program was on screen on December 30, 1956. First colored broadcasting was launched later, only in 1966. The studio from where announcers provided population with news was located near the TV Tower. 61 years ago, before TV broadcasting experienced any progress, the first television tower was constructed. The construction process was launched in 1952 and lasted till 1956. 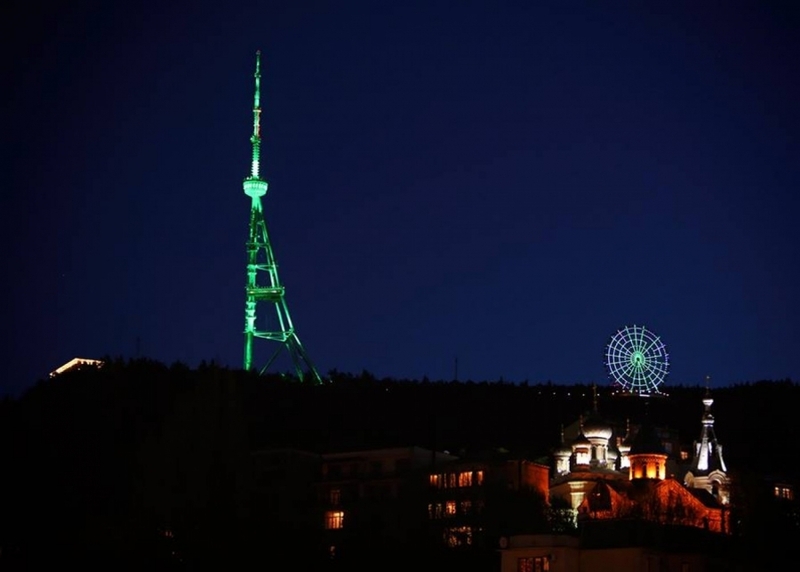 It was of 186-meter height and located near the territory where the present TV tower stands. Its construction was simple and of lattice-frame style. As it was unable to provide a wider range of TV channels, a need of a new tower was observed. After functioning for 16 years the new one was carried to the town of Gori. The construction process was launched in 1972 and lasted for two years, being conducted by means of a crawler. The new TV Tower made it possible to broadcast more TVprograms. Georgia’s Tele-Radio Center has been administering the tower since 1955. The present tower has been put on the list of the unique European TV towers.